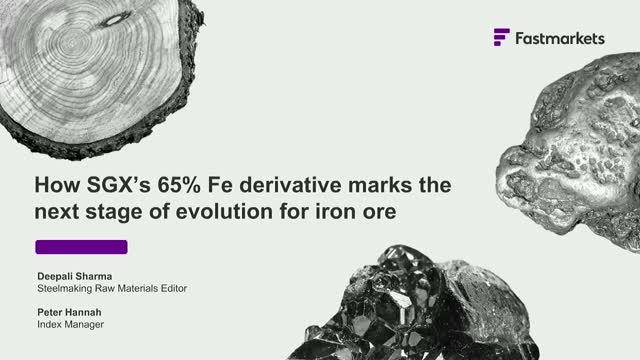 The launch of the Singapore Exchange’s new 65% iron ore derivative contract has been prompted by a structural shift in the market. In this webinar, we will examine the global factors driving this shift, as well the opportunities that the contract offers. The webinar will also explain the methodology behind our daily MB 65% Fe iron ore index, on which the contract is settled. There will be time for Q&A during the live webinar. To submit any questions in advance, please email hello.mb@fastmarkets.com. Learn how Fastmarkets assesses the cobalt market and how you can manage your risk with the new LME cash-settled contract, launched on March 11th 2019. The new London Metal Exchange cash-settled cobalt contract is settled against Fastmarkets MB’s benchmark standard-grade low cobalt price and is referred to as LME Cobalt (Fastmarkets MB). Launched in response to the desire for more hedging tools, in the context of one of the most volatile periods the cobalt market has seen in years, the new Fastmarkets-settled cobalt contract on the LME will provide the market with the ability to manage their price exposure. Fastmarkets has developed strong auditable pricing processes and acquired type 1 IOSCO accreditation for its standard-grade cobalt spot price assessment, ensuring its position as the world’s most trusted and robust industry reference. Learn how Fastmarkets assesses daily alumina indices and aluminium premium assessments and how you can manage your risk with the new LME cash-settled contracts, launching on March 11th 2019. The new London Metal Exchange cash-settled aluminium duty-unpaid European contract will be settled against Fastmarkets MB’s benchmark Rotterdam premium. Launched in response to the desire for more hedging tools, driven by one of the most volatile periods the physical European aluminium market has seen in years, the new Fastmarkets-settled duty-unpaid aluminium contract on the LME will provide the market with the ability to manage their price exposure. Fastmarkets has developed strong auditable pricing processes and acquired type 2 IOSCO accreditation for its spot aluminium premium assessments, making it the world’s most trusted and robust industry reference. The new cash-settled alumina contract will be settled against Fastmarkets MB’s benchmark daily fob Australia alumina index and CRU’s alumina price index – equal weighting given to each index in line with industry usage of indices in physical contracts. This new contract will enable risk management in times of extreme bullishness and uncertainty over future price moves. •Will Chinese steel production continue to beat expectations? •Have operational margins at steel mills peaked? •Prospects of demand for higher-grade iron ore. In the lead up to LME Week join our industry experts as we discuss what the hot topics are for the aluminium market heading into mating season. China’s decision to ban low-grade scrap imports was driven by its ongoing environmental reform measures. More recently, a trade spat with the US has led to further restrictions on several copper products. How have these policies impacted the copper and copper raw materials markets? In this webinar, we discuss the changes we have seen so far this year and how Metal Bulletin has responded in order to continue to provide market-reflective pricing, including the launch of new blister copper and equivalent grade copper cathode price assessments. There will be time for Q&A included. If you would like to submit a question in advance, or would like any further information on the webinar, email us: subs@metalbulletin.com. Join the Chinese language discussion with Metal Bulletin pricing analysts and battery materials analyst in Shanghai and Beijing offices to find out about our price discovery and key price trends in the lithium, cobalt and nickel markets, along with the outlook for battery raw materials. This webinar will be held in Chinese. Volatility in the domestic ferrous scrap industry this year has amplified the need to understand and take advantage of hedging. More customers are asking for fixed prices, creating significant opportunities for scrap users. However, understanding hedging can be challenging. Metal Edge Partners is a commodity trading advisory firm with a specialized focus on ferrous markets. Metal Edge enables its customers to design, implement and execute risk management activities such as hedging raw materials and products. The extensive experience of the Metal Edge team in the ferrous markets has made them the go-to firm when it comes to risk management and strategic advisory for industry players. HedgeStar is a global provider of derivative valuation and hedge accounting services that offers training and consulting on the use of derivatives for risk management. HedgeStar takes the operational burden off of your personnel and does the work faster and cheaper than the competition. Following huge increases in the price of cobalt, Metal Bulletin has consulted with the market to decide the next steps to ensure price assessments are relevant and fit for application in a rapidly evolving market. • What does the emergence of the electric vehicle boom mean for cobalt pricing? China continues to dominate the Asian steel markets. The outlook for the rest of the year remains uncertain and the Asian steel markets continue to be heavily exposed to price volatility. Metal Bulletin’s fob China indices can help you increase your trading margins and reduce price risks in the face of price uncertainty. Join our free webinar to find out more. Substitution risk, EV policy, lithium, cobalt, nickel supplies. Join the team as they discuss the key drivers and price trends in the lithium, cobalt and nickel markets, along with the outlook for battery raw materials. The interactive web seminar will include an opportunity to submit questions or comments to the speakers. If you have any questions about Metal Bulletin’s pricing and coverage of illiquid markets – including those not covered in the case studies mentioned above – please send them in advance to Charlotte Radford at charlotte.radford@metalbulletin.com. Unable to attend? Register now and you’ll be able to listen to the recorded web seminar after it finishes. Join us to discuss CME Group introducing a new copper premium grade A cif Shanghai futures contract based on Metal Bulletin’s assessment. This new copper contract will provide the first, financial settled, exchange-traded futures production to enable customers and market participants to hedge their exposure to the China copper premium. - Conclusions on the feasibility of new reference prices for the tungsten industry, including tungsten concentrates, tungsten scrap, and an APT production cost. - What are the reasons behind the volatility in Turkish, Indian and US scrap prices?